My spice blend changes through the year as I get new plants harvested and dried. It’s a whole new level to seasonal cuisine! Thyme and oregano in late summer, bee balm in spring, rosemary all year round! What does your home taste like? What is the terroir of your territory? The plants, herbs, trees, and fruits that you grow can yield a whole new kind of bounty for your kitchen. Whether your goodies are grown in your yard, balcony, or foraged from your local farm market, you can easily create a unique spice blend that belongs to your household. 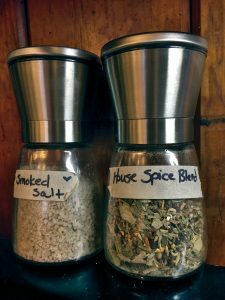 I renew my spice blend every year in the winter after foraging my yard and garden during the spring and summer and fall. This adds fresh flavors to our spice blend, which is an ever-changing combination of seeds, peppercorns, dried herbs, and other goodies! Ok, so in true Pixie fashion, this is not a recipe so much as a technique. The idea here is to inspire you to make your own special blend to flavor your dishes, not to recreate mine! Have fun with the recipe. If you use your blend for a bit but find it lacking, pour it out into a bowl and change it up! It’s hard to take things out, but you can always add more in. 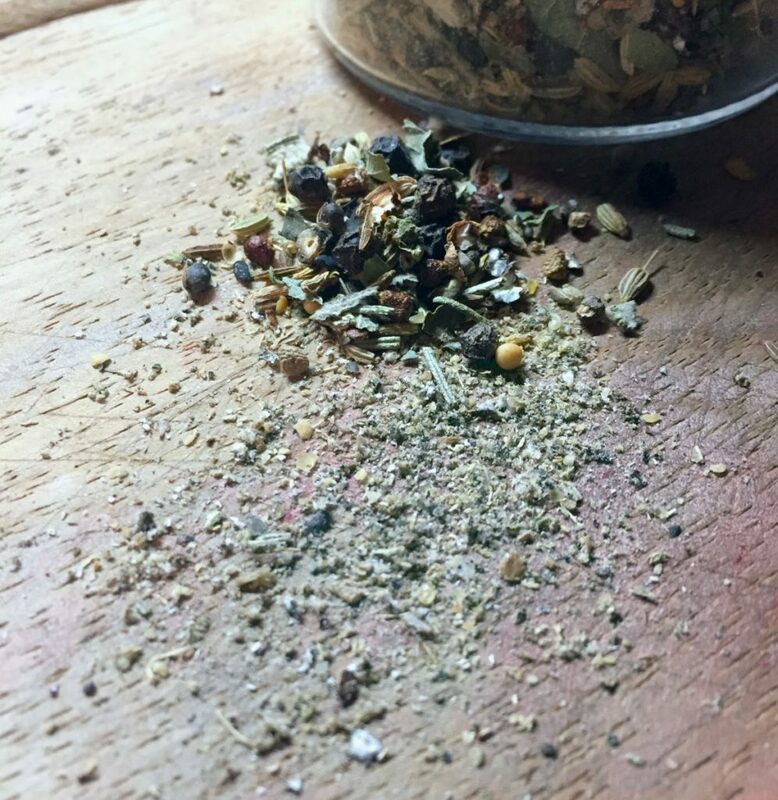 Enjoy making your own spice blend and making a signature spice blend that is unique to your home and garden. 1 part dried herbs and edible flowers: monarda, oregano, sage, nasturtium, lavender, rosemary, parsley, thyme, chives, spicebush, cilantro, etc. If you want to add salt to your blend, I suggest that you mix the above ingredients first and then add the salt in a bit at a time, mixing and tasting it often to make sure you don’t go overboard! 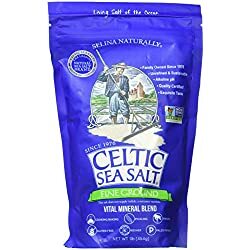 Sea salt is awesome for its nutritional content. Start off by making a small batch first to get an idea of the flavors. That will let you balance it to your liking before mixing it together all willy-nilly. 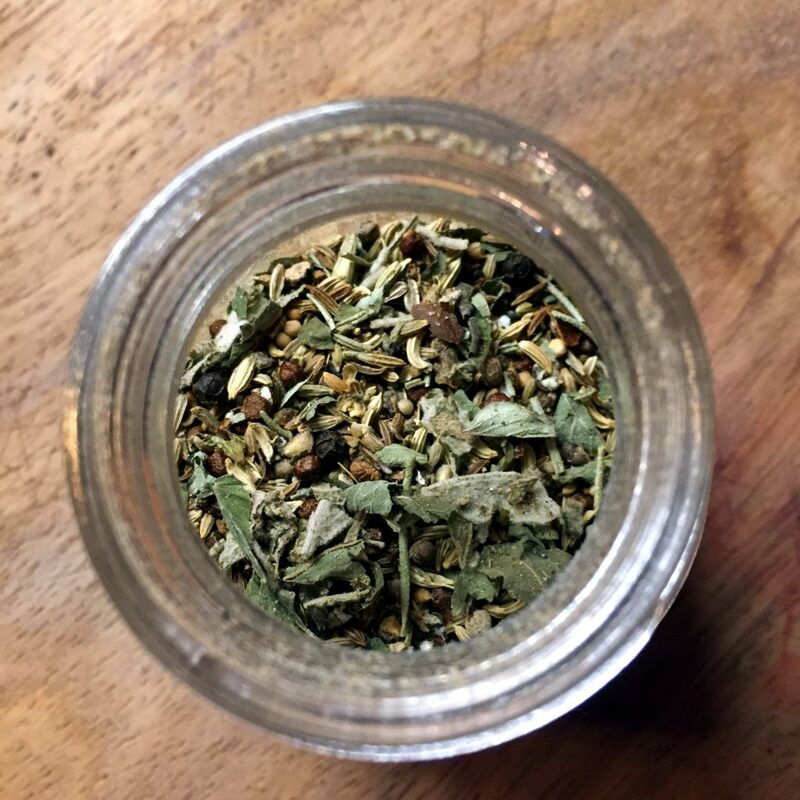 Add about a teaspoon of the herbs and a half teaspoon each of the other ingredients to an electric spice grinder or a mortar and pestle. 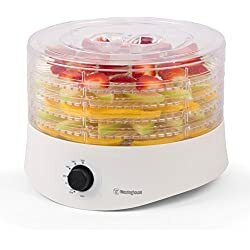 Blend them together and give it a taste – what does it need? 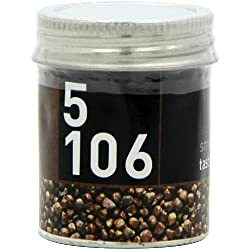 Adjust the spices to your liking but keep track of what you add as you go so that you can roughly recreate it in larger quantity. Once you are satisfied, you can recreate the blend in bulk. 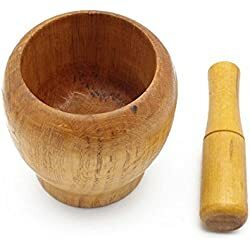 I pour it all together into one bowl and mix it with my hands and then add it into a manual spice grinder, like the kind you often see for whole peppercorns. These are ideal because they keep the herbs fresh and whole, plus you can adjust it to grind your blend as coarse or as fine as you like! 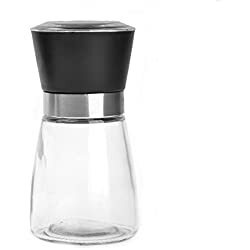 Make sure all of your ingredients are completely dry before adding them to the spice grinder. Moist herbs or spices could grow mold or make your spices clump together. 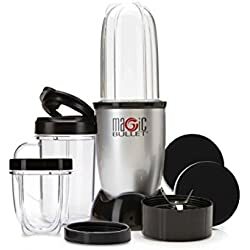 Refillable spice grinders are a dream come true for a blend like this. They come in all shapes, colors, or sizes to fit your kitchen.